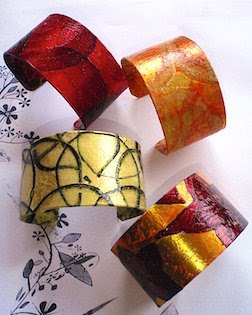 These lovely cuff bracelets are the creation of artist Margaret Dorfman. Handmade from vegetable and fruit parchment that is created by curing, pressing, aging and drying the fruit or vegetable to create a sheet of "parchment" paper. The parchment is then fused onto a copper cuff bracelet form to create each unique bracelet. 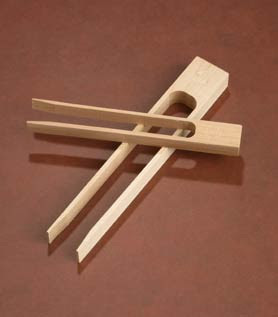 These simple, yet attractive tongs are made especially for retrieving toast and bagels from the toaster. Made from rock sugar maple, they are built to last. A special magic button helps keep them attached to the toaster so they won't get lost. Made in Vermont. 2 sizes; 6 1/2" x 7/8" for toast; 8" x 1 1/4" for bagels.